WTO members welcomed The Bahamas’ commitment to make rapid progress with its WTO accession process. At the fourth meeting of the Working Party on the Accession of The Bahamas, held on 5 April, members expressed their full support to the government of The Bahamas’ ambition to secure WTO membership by the WTO’s 12th Ministerial Conference (MC12) to be held in Astana in June 2020. 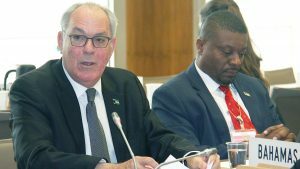 Mr Brent Symonette, Minister of Financial Services, Trade and Industry, and Immigration, who led The Bahamas’ delegation from Nassau said: “We seek to join the WTO because we believe that participating in the rules-based global trading system makes sense for our economy. Participation affirms the importance of that system to the stability and growth of the world economy. We also, however, seek to ensure that our membership provides continuing opportunities for our people to grow and prosper through meaningful participation in the ownership and prosperity of their economy. About these dual interests we are very deliberate.” His statement is available here. Since the last meeting of the Working Party in September 2018, the delegation of The Bahamas has been engaged with members bilaterally. At the meeting on 5 April, The Bahamas reported that on the margins of the Working Party meeting it has concluded one bilateral market access agreement and with other members there has been tangible progress. Members were encouraged that the Working Party was meeting just six months after the previous meeting as a result of the concrete results of the ongoing domestic reform discussion in Nassau. The Chair invited members to continue examining The Bahamas’ foreign trade regime through additional comments and questions. He further invited the WTO Secretariat to prepare elements of a draft report of the Working Party. In order to enable the Working Party to track The Bahamas’ progress in implementing a WTO-consistent trade regime, The Bahamas delegation was invited to submit a revised Legislative Action Plan, together with newly enacted WTO-related legislation, for review by the Working Party at its next meeting. The date of the next Working Party meeting will depend on the availability of the required inputs and on progress on the market access front, the Chair said. The Working Party on the Accession of The Bahamas was established in July 2001 and held its first and second meeting in September 2010 and in June 2012 respectively. At the end of 2017, the then newly elected Bahamian Prime Minister Hubert Minnis contacted the WTO Director-General Roberto Azevêdo to say that his government was ready to resume its accession journey. The third meeting of the Working Party was held in September 2018.